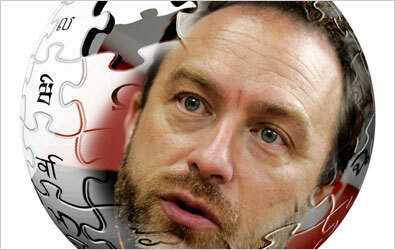 Since he helped create Wikipedia in 2001, Jimmy Wales has been called many things: benevolent dictator, constitutional monarch, digital evangelist and spiritual leader of the tens of thousands of volunteers who have made the online encyclopedia one of the top 10 most visited Web sites. Unfortunately for him, the news media love a good royalty scandal and, in the last few weeks, he has been getting the royal treatment. Last month, Mr. Wales was accused of intervening to protect the Wikipedia page of a TV news commentator with whom he had a romantic relationship. The accusations were fueled by text messages, said to be between Mr. Wales and the commentator, Rachel Marsden, that were published on a gossip Web site. And there have been persistent questions, chiefly raised by a former employee, that Mr. Wales has abused his expense account, including filing for a $1,300 dinner for four at a Florida steakhouse that was ultimately denied and lacking receipts for $30,000 in expenses. In some ways, these allegations — trivial and personal as they might seem — illustrate the growing pains Wikipedia is now experiencing. The populist impetus for Wikipedia — building an open-source encyclopedia — has been spectacularly fulfilled with more than 2.2 million separate articles in English, 52 million unique visitors in December in the United States, according to comScore Media Metrix and brand recognition that puts it in the upper echelon with Google, Yahoo and Microsoft. Until recently, however, Wikipedia was run more like a storefront community center than a digital-age powerhouse. What was a nine-person operation — a top 10 Web site had a paid staff of less than 10 — has just recently grown to a 15-person operation. Last year’s $2.2 million budget grew to $4.6 million this year. “A surprising number of people don’t even know it is a nonprofit,” Ms. Gardner said. “They say, ‘How do they make their money, anyway?’ They assumed there were ads or some other way.” In fact, the project relies on fund-raisers, and its latest one, Ms. Gardner said, received donations from 45,000 individuals, with a $30 average contribution. Mr. Wales and the board of the Wikimedia Foundation have tried to professionalize the project, moving its offices from St. Petersburg, Fla., to San Francisco, to be near the talent, entrepreneurial spirit and wealth of Silicon Valley. The board of seven trustees, made up of appointed and elected members including Mr. Wales, has brought in new administrators, beginning with Ms. Gardner, a former journalist who had run the Canadian Broadcasting Corporation’s Web site. But members of the Wikipedia community — scattered around the globe, writing in more than 200 languages — remain consistent in their belief in a decentralized power structure and noncommercial principles. And they aren’t sure what to make of the move to the big city, with its reputation as the home of irresistible temptations. The persistent arguments about whether to accept any kind advertising, no matter how indirect, to increase revenue — something Mr. Wales and Ms. Gardner among others say they oppose — have recently flared up again. 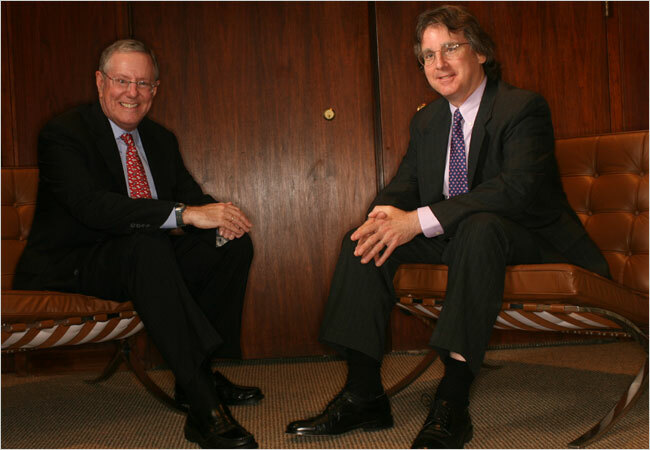 And there have been questions raised about the foundation’s close relationship with Roger McNamee of Elevation Partners, a venture capital firm in Silicon Valley, and who has helped arrange two sizable donations to Wikipedia. Some members further wonder if Mr. Wales, who has created a company, Wikia, to make money from wikis and to implement a volunteer-created search engine, will reduce his role within Wikipedia. But Mr. Wales said he was adamant. It is natural that over time a visionary leader’s role is diminished and that is good thing, he said, quoting Bertolt Brecht, “unhappy is the land that has no heroes — no, unhappy is the land that needs heroes.” Despite some of the attacks on Mr. Wales, he is still largely a hero within the Wikipedia community — walking through the annual conventions with assistants in tow, greeting the most enthusiastic Wikipedia contributors from across the globe, receiving invitations to the World Economic Forum in Davos, attending George Soros’s birthday party. Ms. Gardner said there will always be a need for what Mr. Wales provides. 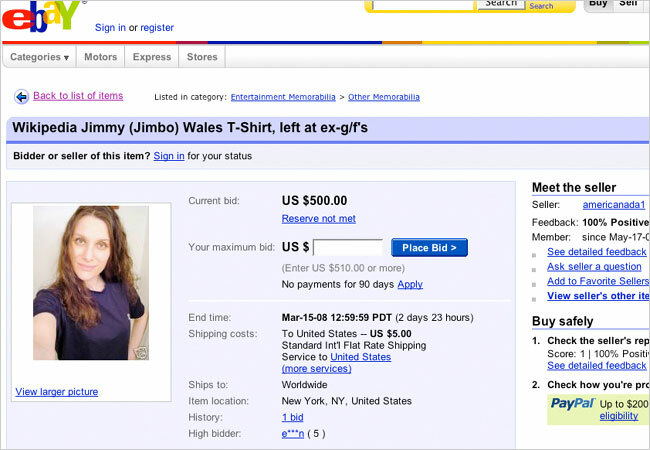 Photo Rachel Marsden, a New York columnist and former Fox News commentator who dated Jimmy Wales, tried to auction a T-shirt, among other items, that he left in her apartment. Mr. Wales wrote on his user page that he would not interfere before meeting Ms. Marsden, and summed up, “My involvement in cases like this is completely routine, and I am proud of it.” However, the incident did pry open his personal life to Silicon Valley gossip sites (he said that he had been separated from his wife when he met Ms. Marsden) and has created the embarrassing spectacle of having his old laundry put up for auction on eBay. Beyond the personal questions, many Wikipedia members have expressed reservations about the project’s relationship with Elevation Partners. Mr. Wales said in an interview that Elevation Partners had expressed interest initially in business opportunities with Wikipedia, but “it took one meeting for them to realize it was off the table.” He added: “Certainly there can be no investment in Wikipedia. Wikipedia is a nonprofit and always will be.” He said he also has had inquiries from other venture-capital firms, who likewise were told to look elsewhere. Ms. Gardner said that Mr. McNamee in the past had lined up a $500,000 donation, and arranged another $500,000 donation that came through last week.